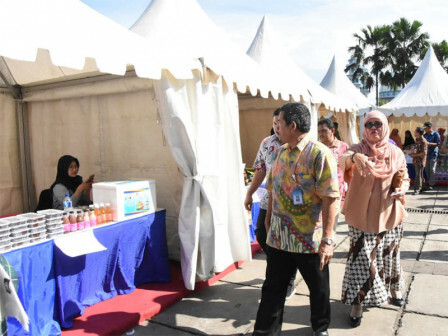 50 small medium enterprises (UKM) who are coached by East Jakarta Cooperative Micro Small and Medium Enterprises and Trade (KUKMP) Sub-department sell their products in Bazaar at GOR Ciracas, East Jakarta, Thursday (3/21).
" We try to help our coached UKMs to sell their products"
East Jakarta Secretary, Usmayadi stated, those 50 coached UKMs are the representatives of entrepreneurs in 10 sub-districts. One of the coached UKMs, Nemin Tuih (53) appreciates local government who gives this chance to her. "Alhamdulillah, this event really helped me in marketing my souvenir products. In this bazaar, I sell handmade ondel-ondel miniature," he expressed, Thursday (3/21). Acting East Jakarta KUKMP Sub-department Head (Plt), Berlin Hutapea explained, this bazaar is held from Thursday (3/21) until Friday (3/22) and opened to public. Last year, these 50 coached UKMs have been trained at sub-district level. "We try to help our coached UKMs to sell their products in various places thus more people know about their products. As the result, they will be eager to continue developing their business," he said.